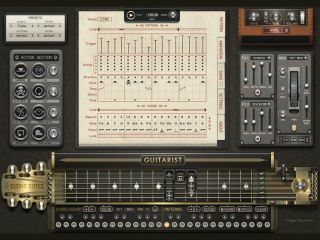 Sugar Bytes Guitarist: "the most complete guitar software of all time"
Guitarist promises to do it all. While some software developers have been content to create just guitar amp and FX emulations, Sugar Bytes' Guitarist promises to be a complete, end-to-end six-string solution. By this we mean that it'll enable you to create not just the tone, but the guitar playing itself: both pattern and chord step sequencers are included for this purpose. The Action Section enables you to tweak patterns in real time (Loop, Damping and Timestretch are among the options here) and patterns can be combined to create longer riffs or songs. On the tone shaping side there are two amp models and two effect units, plus a dedicated wah pedal. Guitarist sounds promising on paper, but we'll need to see it in action before we can decide whether or not Sugar Bytes' claim that it's suitable for guitar players, keyboard players and producers holds water. Look out for it in September on Mac and PC and in VST/AU formats. The price will be confirmed when Guitarist is released. UPDATE: Guitarist is avialable now priced at €199/$249.